WASHINGTON (CNS) — In reaction to the April 17 death of Cardinal Francis E. George, the retired archbishop of Chicago, U.S. bishops and other Catholic leaders recalled his leadership, faithfulness and friendship. — “The death of an exemplary churchman such as Cardinal Francis George brings much sadness at a time of joy and resurrection. We find peace in knowing that, after so much suffering, he has been raised up with our Lord. As archbishop of Chicago and president of the U.S. bishops’ conference, Cardinal George led as a kindly servant and unmatched intellectual, a man who encouraged everyone to see how God makes us all brother and sister to one another. I join with my brother bishops in thanking God for the gift of his witness and invite all to pray for the faithful repose of his soul.” Archbishop Joseph E. Kurtz of Louisville, Kentucky, president of the U.S. Conference of Catholic Bishops. — “It was with great sorrow that I learned today of the death of Cardinal Francis George, whom I have known and had the privilege of working with for over 25 years. As brother bishops, we had many opportunities to work together on a number of committees in service to the U.S. Conference of Catholic Bishops. Over our many years of association, I appreciated Cardinal George’s many intellectual contributions to the conference, his pastoral concern for the faithful in his diocese, and his example of faith and courage. Particularly over the last couple of years as he fought his illness with great grace, he was an example of faith in the Lord. I offer my prayers and sympathy to Cardinal George’s family and friends and the many people whose lives he touched by his ministry over the years and ask the Lord to grant him eternal rest.” Cardinal Donald W. Wuerl of Washington. –“While we have all realized for a while that it was near, the passing of Cardinal Francis George still comes as a jolt, and leaves us with a sense of emptiness and loss. I assure Archbishop (Blase J.) Cupich and the Catholic family of Chicago of our love, condolences and prayers here in New York. I will miss him as a pastor, friend and guide, and can only thank God for the gift that he was and will ever be.” Cardinal Timothy M. Dolan of New York. — “The church has lost a great servant, the Archdiocese of Chicago has lost a tremendous shepherd and I have lost a personal friend and mentor. I consider myself blessed to have been ordained a bishop by Cardinal George and then served as one of his auxiliaries. His insight into church teachings, his love for the church of Chicago and his commitment to Jesus Christ shaped and formed my episcopacy. I have often said Cardinal George was the undeclared intellectual leader of the conference of Catholic bishops. We will all miss his voice, but we will continue to be shaped by his vision.” Archbishop Jerome E. Listecki of Milwaukee. — “I was deeply saddened today to learn of the death of Cardinal Francis E. George, archbishop emeritus of Chicago. Cardinal George was a close friend over many years, from the time I was a young bishop in Rapid City (South Dakota). We talked often. He was a constant source of good counsel and encouragement. As a fellow religious, he was a model for me of living the Beatitudes well, despite the daily crush of leading a large local church. As a bishop and a scholar, he was the finest intellect the church in America has seen in many decades. The only consolation in losing him is knowing that he served the Lord well, and the Lord has welcomed him home.” Archbishop Charles J. Chaput of Philadelphia. — “Cardinal George has played a unique role in the life of the church in the United States and the world. The gifts of his faith, his intellect, his strong leadership and vast experience, combined with his joy and love for the church, have served as an inspiration and a witness throughout his priesthood. … Cardinal George combined greatness with simplicity in all he did and I pray he may now be enjoying the fullness of eternal life in the kingdom of Christ to whom he dedicated himself so fully.” Bishop David J. Malloy of Rockford, Illinois. — “Cardinal Francis George was a good and faithful bishop, a leader in the American church and a dedicated witness to the Gospel. My thoughts and prayers are with his family, his religious community and the Archdiocese of Chicago.” Holy Cross Father John I. Jenkins, president of the University of Notre Dame. 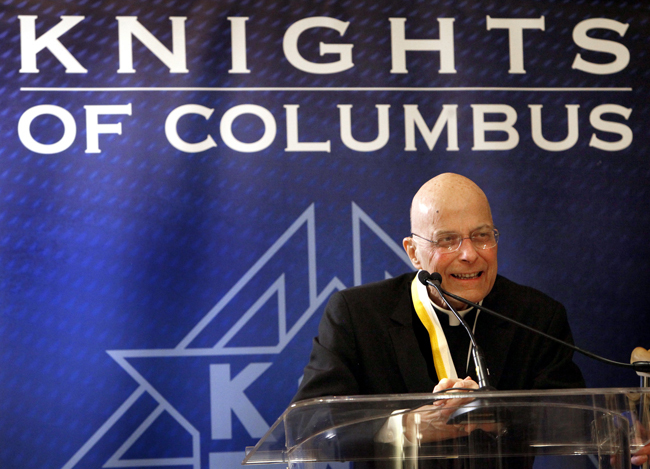 — “We at The Catholic University of America were fortunate to have Cardinal George as a member of our board of trustees for more than 20 years, including during the entire time that he was cardinal archbishop of Chicago. I was honored to have the opportunity to publicly thank him for his wise counsel to me and for his long and devoted service to his alma mater at our December board meeting last year. He was a man who put his great intellectual gifts at the disposal of Jesus Christ and his church and who candidly spoke the truth in season and out.” John Garvey, president of The Catholic University of America.